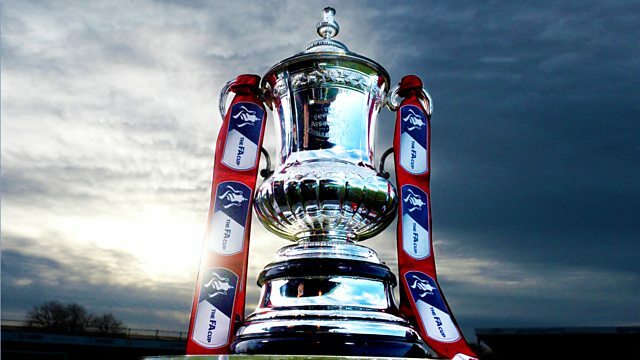 Highlights from Sunday's fixtures in the FA Cup fourth round, featuring Chelsea v Newcastle and Cardiff City v Manchester City. Browse content similar to Fourth-Round Highlights - Sunday. Check below for episodes and series from the same categories and more! booked in the EFL Cup final. were Mark Lawrenson and Guy Mowbray. job Neil Warnock is doing. by Neil Etheridge. Gundogan again. he takes things very carefully. a fantastic position this is. expecting him to do that. so simple -- Cardiff wall. Simon Long kept his flag down. going to count. The flag is up. We don't have VAR today. date you want it, we don't have it! of freedom in the penalty area. Bluebirds 0- 2 Blue Moons. the ball back when he gave it away. to get into the box by Joe Bennett. what, that is a read. chance to pinch it away from him. for it when he did. from Junior Hoilett. So close. and Sterling denied by Etheridge. Read it to Morrison as well. Bernardo Silva and here they come. goalkeeper, it was too close to him. little pass into the path Danilo. going to be sent off. just come on as well. common should have been gone. fighting every game, so proud. where we were before Christmas now. didn't it? The free kick like that. yellow, how did you see it? man for man but it did not work out. like a matter of inches in it. There were a few today. Arsenal. Moses drops to the bench. Caballero down quickly to the post. bit, not easy at hip height. a great effort, it's not far wide. beautifully with his left foot. Batshuayi. Pedro now to Eden Hazard. Batshuayi is in a good position. Kante, only as far as Henri Saivet. Hazard. That must have been tight. don't think that's correct at all. Pedro, turning away from Mbemba. the moment. It's Alonso. It's 3-0.
a home debut for Ross Barkley. feet and is denied by Darlow again. stopper. It's a really good turn. have to concentrate on the league. the kind of thing you do? win, that was it, wasn't it? Chelsea a plan B, Nathan? him get two goals today. not the manager's favourite player. helm, life should be pretty easy. they looked like relegation fodder. impossible to come straight back up. of the action on Wednesday night. Premier League matches in midweek. against Spain gets under way. those on the GB team. team visit the get inspired website. I am off to get myself a cap. At this stage last season, Leicester City needed a replay to beat Derby County, while Lincoln City beat Brighton & Hove Albion 3-1 to provide one of the biggest FA Cup shocks in recent years.